A cocktail with a chocolate fudge swirl and cocoa-sugared rim. In a small bowl, combine sugar and cocoa powder. Wet rim of glass with water and dip into mixture. Set aside. In a food processor, combine raspberries and 1 tablespoon of water. Blend until smooth. Strain through a fine mesh strainer, discard seeds. Reserve pureed raspberries. Microwave fudge topping for 30 seconds and transfer to a squeeze bottle. Decorate glasses with a swirling pattern. Divide raspberry puree evenly between the glasses. 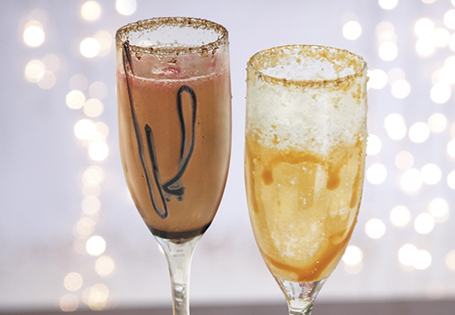 Top each glass with champagne and enjoy immediately.